When you go tankless you lose the holding tank that constantly fills and heats water, even when you’re not using it. Tankless water heating systems are often referred to as “on demand”, meaning they heat incoming water only when you need it. A powerful heat exchanger is activated by the incoming flow of water and is heated to a preset temperature that you control. This compact unit, the size of a carry-on suitcase, can be mounted almost anywhere you choose, inside or out. Never worry about running out of hot water again. Do you have an oversized tub? Does your shower have body sprays? Number of residents in your home? For back-to-back showers, a full (and hot) garden tub, multiple water fixture tasks throughout the house. Tankless units have a higher efficiency rating and lower your home’s energy consumption resulting in lower energy bills. Water is heated only when it is used eliminating the need to store and heat water 24 hours a day. The lifespan of a tankless unit is twice that of a traditional tank unit and is backed by a hefty warranty, typically 12-years on the heat exchanger. Without a tank, there’s less worry over leaks or ruptures. allows you to set the desired temperature and prevent scalding accidents. trap the condensation and reuse it to provide additional efficiency and savings. some units come with a recirculation pump eliminating the ‘cold water sandwich’ and providing instant hot water. Some systems even learn your habits, having hot water ready for you at the same time each day. Adjust the temperature, activate recirculation, check alerts and more from your smart phone or tablet. A gas tankless water heater is an efficient appliance that uses a heat exchanger to heat water only when it’s needed, which can help you save on your energy bill. Hot water is turned on. The computer signals the burner(s) to ignite. Keep your tankless running efficiently with a check-up and flush. Ongoing maintenance helps keep your heat exchanger free from scale buildup which impacts the efficiency of the unit and it’s lifespan. ALL water heaters, tank or tankless can have scale buildup over time. The good news is a tankless flush will quickly clean the buildup and lengthen the life of your appliance. Schedule your service by calling our service department at (803) 323-5304, option 2 (non warranty repair service). Please note: A pre-installed drain kit is necessary to run the flush service. YCNGA installs a drain kit as part of our standard installation, but other installers may not. If your tankless does not have a drain kit we will not be able to run the flush through your unit. Freeze protection comes standard on all Rinnai Tankless Water Heaters. As long as there is both power and gas supply to the appliance, freeze protection guards against outside temperatures as cold as -22°F (‐30°C) for indoor models, or as cold as -4° F (-20° C) for outdoor models when protected from direct wind exposure. Because of the “wind-chill” effect, any wind or circulation of the air on the unit will reduce the effectiveness of freeze protection. The freeze protection features will not prevent the external piping from freezing. It is recommended that hot and cold-water pipes are insulated. Pipe cover enclosures may be packed with insulation for added freeze protection. In the event of a power failure at temperatures below freezing, the water heater should be drained of all water to prevent freezing damage. In addition, drain the condensate trap and drain line. NOTE: Water can freeze inside the water heater and result in a ruptured heat exchanger and water lines. Warranty does not cover any damage due to freezing. 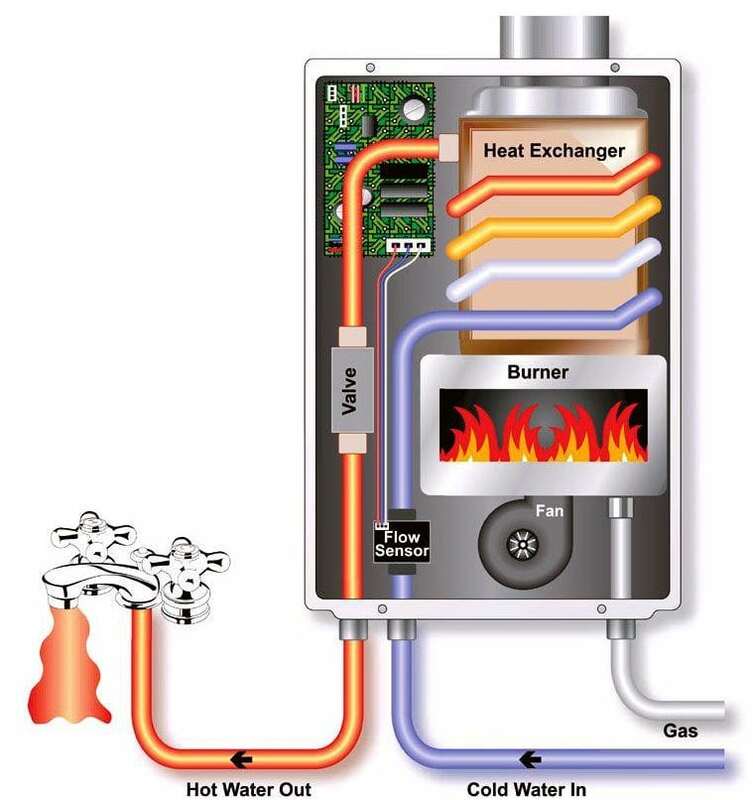 If the Rinnai unit or the external piping has frozen, do not operate the tankless water heater. 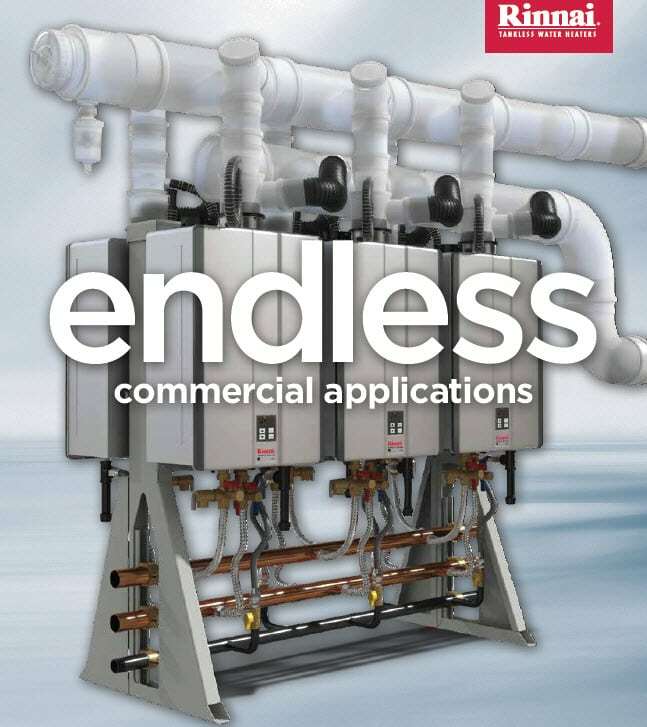 Offering 96% thermal efficiency, the Rinnai Commercial tankless models feature a heat exchanger designed for the demands of business which helps maximize the life of the product and ensure smooth business operations. 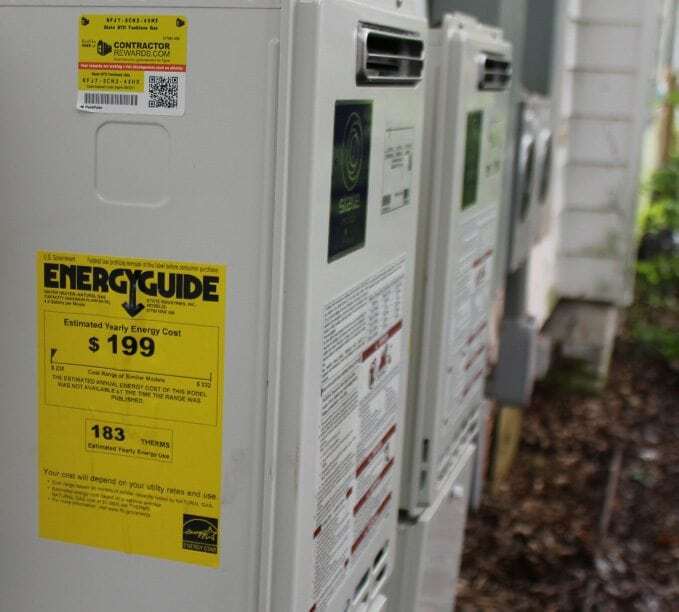 Working only on-demand, the 199,000 BTU model operates more efficiently than tank-style water heaters to save on capital and life cycle costs. 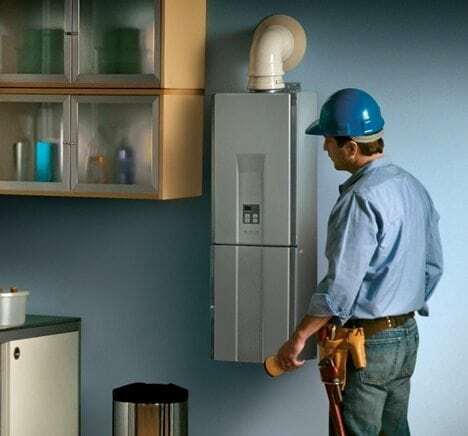 Available individually in space-saving indoor and outdoor models, the Commercial Energy Star certified C199 also comes standard on Rinnai’s Tankless Rack and Wall Mounted System providing safety and security through the redundancy of multiple units that ensure continuous operation. 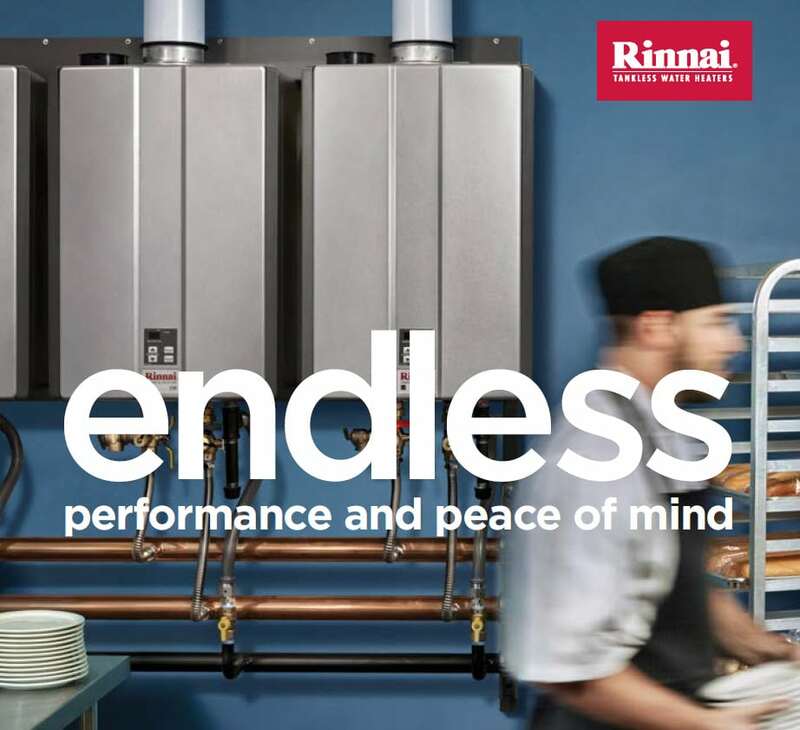 Offering a reliable and more efficient source of hot water, Rinnai Tankless Systems supply commercial buildings with an endless supply of hot water and savings up to 40% over traditional systems*. The dynamic Demand Duo™ is the perfect solution for direct replacement of most traditional commercial standard and high efficiency tanks. The Demand Duo provides hot water performance for peak demand, with a supply that goes the distance. Combining the on-demand, continuous supply of tankless with a 119-gallon tank, condensing technology produces consistent water temperatures for smooth business operations and multiple venting options offer installation flexibility. The Rinnai Demand Duo is a master multi-tasker and backed by Rinnai’s nearly 100-year reputation of quality and reliability with a 6-year HEX and Tank warranty*. The Demand Duo can also tie into a building management system sending alerts when the system needs attention providing peace-of-mind monitoring protection to put the efficiency and performance of your hot water on cruise control. Why choose the Rinnai Demand Duo? The Demand Duo is the smart choice offering the “best of both” for on demand and continuous hot water. Switch to natural gas from another energy source and get a $400 rebate, applied to your purchase order. Ask your YCNGA sales representative for more details. 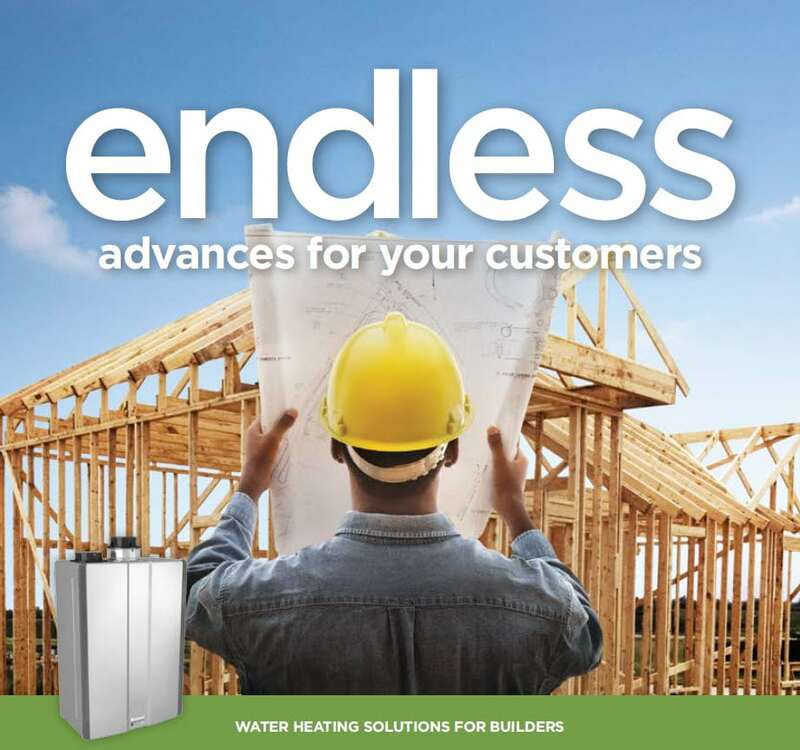 We offer interest-free financing on tankless water heaters up to 36 months. Homeowners who qualify pay 20% down with the remaining balance placed on their monthly gas bill… interest-free! Buy with confidence. We make it easy! 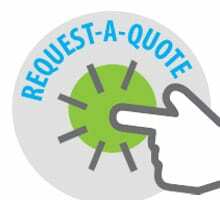 Our sales team completes all manufacturer rebate forms and product warranties for you! We’ve been in the gas business for 60 years and we service what we sell.